A family tree used to take years of painstaking research. But with the advent of DNA testing, more people are discovering their roots and the travel industry is taking notice. So said the translator after my husband Brian and I arrived at the rural Slovakian home of his relatives, the cousins we'd just learned about. This unexpected visit followed months of chasing a trail to find his grandfather's best friend's daughter in the small northwestern town of Bytča. This also being the early 2000s there were letters — the handwritten paper kind in the mail translated thanks to a volunteer we found by running an ad in the Slovak Spectator — and once on the ground, a University of Zilinia professor's daughter we'd hired to translate and help us find Brian's great-great-grandmother's grave. We'd just discovered that cousins still lived in the area and piled into the rental Opel to just show up at their step. “Slovensko, Slovensko,” they cried as they clutched Brian's cheeks and showed him their snapshots of him as a baby, sent years ago by his grandfather who'd fled communist Czechoslovakia to the United States. An avalanche of food came our way, accompanied by nonstop smiles and eyes shining with tears. They wanted us to spend the night but our translator had to go, and we had reservations awaiting in next-door Poland. Had we known, or been able to plan better, the visit could have been longer, allowed us to engage more. We left with many kisses and promises to return. This desire to find and connect with our roots is nothing new, but thanks to the availability of DNA testing it's easier than ever before to actually trace that family tree. And findings aren't just passive information to file away. Armed with a new understanding of who they are and where they come from, people are flocking to their family's homelands in such droves that this DNA travel, so to speak, landed on Lonely Planet's list of Top Travel Trends for 2019. 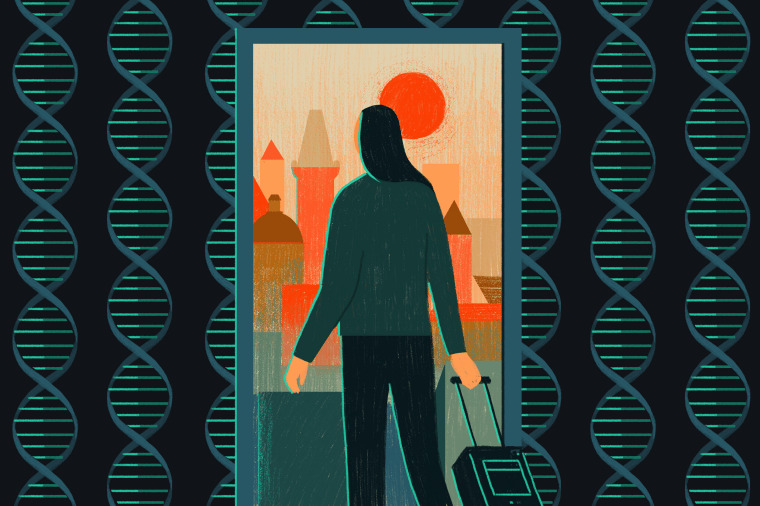 While many intrepid travelers will forge ahead on their own, an industry is springing up around tailoring guided DNA trips. Go Ahead Tours' Hauck worked with Ancestry.com to to develop an evolving line of small group tours to Europe that come complete with DNA testing and an on-board genealogist. The tour company and Ancestry teamed up to offer guided, family heritage-themed trips to the most popular destinations for DNA travelers — Italy, Ireland, Germany and Scotland. A fringe benefit of traveling with a group, she added, is “you're also on tour with people super interested in the same place.” Her pro tip? “Make an effort to get to know the people on your tour because there's a lot of knowledge in that group.” Tour participants have even found relatives on the tour itself, she said, and end up traveling on together. While on tour exploring significant sites in the region there's free time “to peel off to visit a specific, street, school, cemetery or homestead,” Hauck said. I have to think some of the magic found in spontaneous, independent travel's mishaps would be missing from such a choreographed excursion. But then again, there's real heartbreak in traveling so far only to miss out on or limit a family connection. As for our Slovakian cousins, we kept our promise to return, and indeed went back four years later. This time we planned ahead and traveled with Prague-based journalist Petr Kočí — a miracle Craigslist connection who'd generously agreed to not only translate but drive. And this time we were able to have a true family visit, complete with polishing off a bottle of slivovitz made of their own fruit in their community's shared distillery. Halfway through the bottle one of the cousins paused for a question. “When you travel,” he asked us through Kočí, “is it to discover how people are different, or how they are the same?” As we looked around at our long-lost family, their very bones an echo of my husband's, the answer was clear.